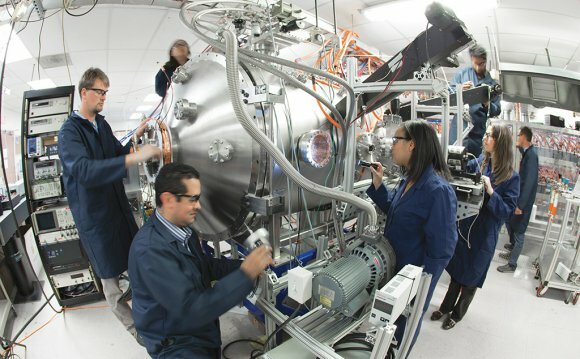 American defense contractor Lockheed Martin has issued a statement declaring it has made a technological breakthrough in developing a power source based on nuclear fusion. It's hoping to have a prototype ready in five years — and a small, functional unit ready by 2024. It's a big claim, but if they're being honest it could be a huge development. The company is basically saying that it's figured out a way to harness the same kind of nuclear reaction that heats the sun and that this process can be replicated in compact form to power cities and vehicles on Earth. Quickly, nuclear fusion is the process of making a single heavy nucleus from two lighter nuclei. The change in mass produces a considerable amount of energy. Harnessing fusion has been the Holy Grail of physics, a game-changing solution that could provide a virtually unlimited source of cheap energy. Lockheed Martin says it can be done on a very compact scale, and that it can build a reactor small enough to fit on the back of a truck and ship around the globe. The reactor could also be used to power a U.S. Navy warship, and eliminate the need for other fuel sources that present logistical and cost challenges. According to project lead Tom McGuire, Lockheed Martin is now going public to find potential partners in industry and government to help them take the breakthrough to the next level. McGuire's small team has been working on fusion energy at the company's secretive Skunk Works for about four years. There are currently several patents pending that outline the approach. "Our compact fusion concept combines several alternative magnetic confinement approaches, taking the best parts of each, and offers a 90 percent size reduction over previous concepts, " noted McGuire in an official statement. "The smaller size will allow us to design, build and test the CFR in less than a year." Compact Fusion Reactor? Compact Fusion Reactor.